Today’s video is all about the underhanded tactics of the egg industry in the United States. For decades, the American egg industry battled and continues to battle anyone who dares to say anything even slightly negative about eggs, especially if these statements are backed by credible scientific proof. Under Section 107 of the Copyright Act 1976, allowance is made for “fair use” for purposes such as criticism, comment, news reporting, teaching, scholarship, parody, and research. Fair use is a use permitted by copyright statute that might otherwise be infringing. Non-profit, educational or personal use tips the balance in favor of fair use. 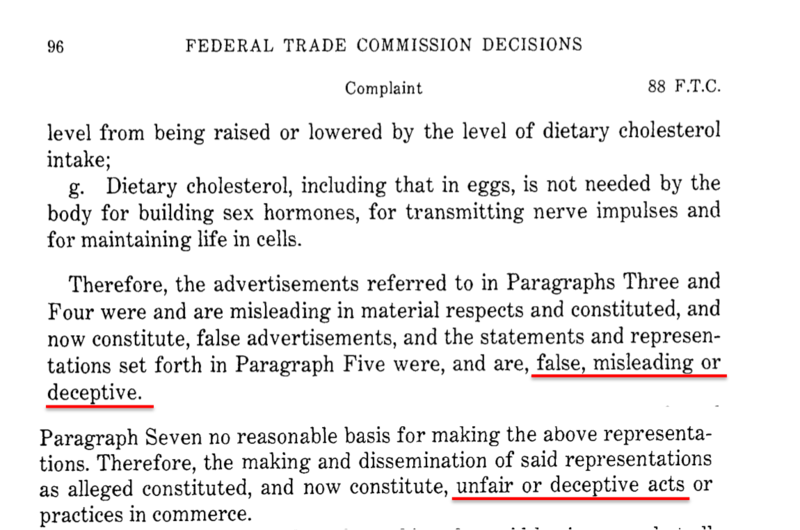 Filing a false DMCA claim is a felony in the United States. This is the first video in a series I’ll be releasing on eggs. In later videos, I’ll discuss the health debate surrounding eggs and the ethical issue surrounding egg production. Be sure to subscribe so you don’t miss those. If you’d like a brief overview on eggs, you can check out my video on eggs for kids. Today I’m going to lead you through some of these exchanges, which range from completely absurd and nonsensical pseudoscience to illegal and aggressive corporate sabotage, all the way to outright threats of physical violence. For citations to all the documents and studies I’ll be referencing, check out the resources below. Our journey into the egg controversy begins in 1961 when the American Heart Association took a stand on the association between dietary cholesterol and heart disease–namely that there was an association. In response to this devastating news, the egg industry formed the almost impartial-sounding National Commission on Egg Nutrition in order to fight theses claims in the most American of ways: by launching a massive advertising campaign. 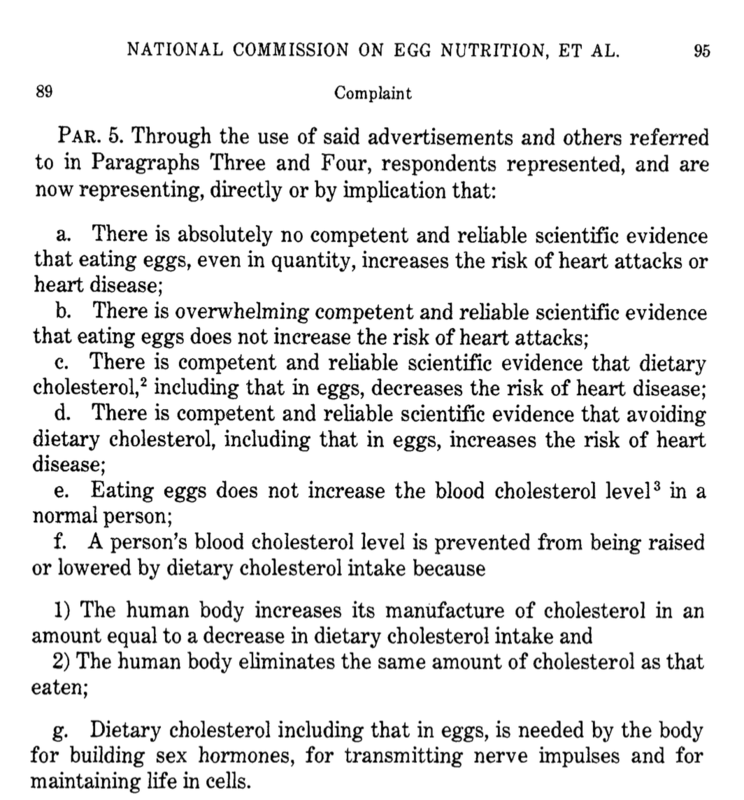 The decision said that egg advertisement claims such “there is competent and reliable scientific evidence that dietary cholesterol, including eggs, decreases the risk of heart disease” [2 p.95-96] and that “the human body eliminates the same amount of cholesterol as that eaten,”[2 p.95-96] were untrue. Sure enough, non-egg-industry-financed studies consistently showed that dietary cholesterol is harmful to our health. Which, of course, the Egg industry found less than egg-ceptional. (Just wanted to see if you were still paying attention…) because it only gets better from here! Around this time, our little engine that could, the American egg industry, continued their efforts to disprove the wicked cholesterol conspiracy. The United States Senate Select Committee on Nutrition and Human Needs, known as the McGovern Committee after its chairman, was originally formed to address concerns about hunger and malnutrition in the United States but expanded in 1974 to include national nutrition policy and go after the major killers of overnutrition, with heart disease leading the pack. Needless to say, the egg industry was concerned. But don’t worry—our little underdog fighting against Big Government didn’t give up. They again showed their true American colors by launching yet another advertising campaign, this time armed with “scientific evidence” based on these five studies, which had just been completely disproved. Back to our unsung hero, who continued to claim dietary cholesterol is an essential nutrient and that our bodies naturally lowers their cholesterol production in response to higher dietary cholesterol consumption. To back up this last claim, the egg industry cited outdated cholesterol studies, which used isolated cholesterol crystals before it was known that our bodies don’t absorb cholesterol without the presence of dietary fat. But who needs valid, up-to-date science when you have the results you want? Internal memos retrieved by the Freedom of Information Act and highlighted by the nutrition powerhouse himself, Dr. Michael Greger of Nutritionfacts.org, reveal the egg industry tried to pay scientists to speak against this study. When they were unable to find a scientist willing to refute the study, a miracle occurred. An email from an MD, PhD, MBA, or “Doctor Doctor” as Dr. Greger says, discredited the study. Yet when the study’s principle investigator responded, they found out that this doctor didn’t exist and the email had come from a hacked email account of someone who’d been on vacation. Dr. Greger produced a response from the head of the USDA’s poultry research and promotion program qualifying that the recommendations never changed. 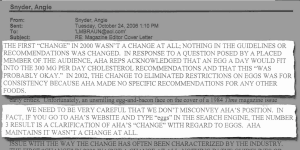 What actually happened was, in response to a question posed by a planted audience member, the AHA had acknowledged that a single egg could technically fit under the 300mg a day total cholesterol limit set for individuals with normal cholesterol levels, if you then eliminated all other forms of cholesterol from your diet. 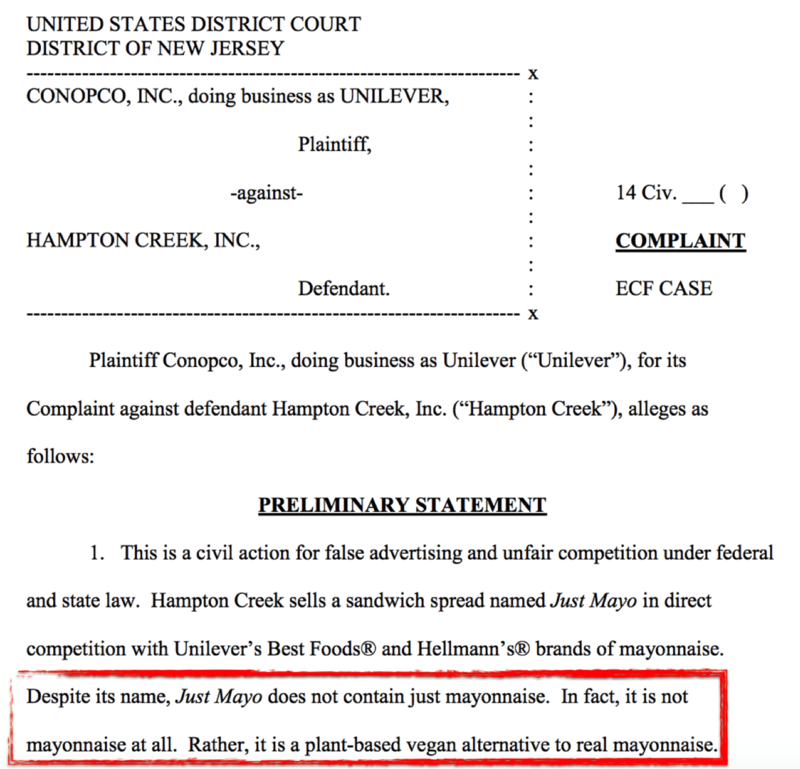 The most recent display of tenacity, ingenuity and total balls-out brazenness on the part of the egg industry is the attack on Hampton Creek, formally Beyond Eggs, makers of Just Mayo and other plant-based foods. 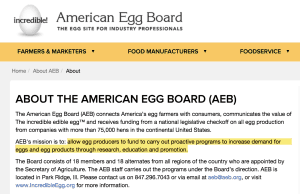 The American Egg Board went for a multi-prong attack. 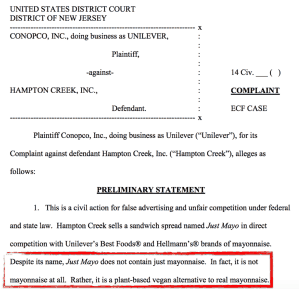 In December 2013, they reached out to Anthony Zolezzi, an external sustainability contractor and self-proclaimed “eco-entrepreneur,” who’d said he could have Whole Foods refuse to sell Hampton Creek’s Just Mayo. It would only take a single phone call. And, of course, an implied fee. When they failed to stop Whole Foods from carrying Just Mayo, the American Egg Board went to phase two with the help of the USDA. 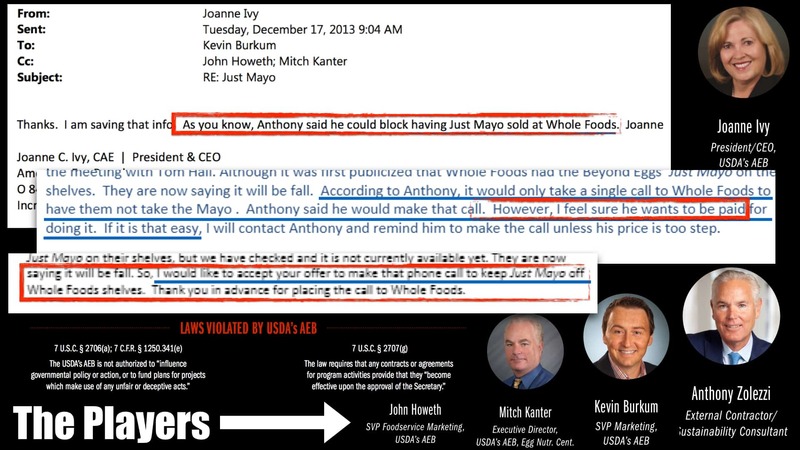 In January 2014, Roger Glasshoff of the USDA proposed to report Just Mayo to the FDA for a false labeling claim. The FDA issued a warning letter  to Hampton Creek about misleading consumers by using the term “mayo” and the image of an egg while their product did not actually contain eggs. Because that’s the most misleading advertising we’ve come across so far. 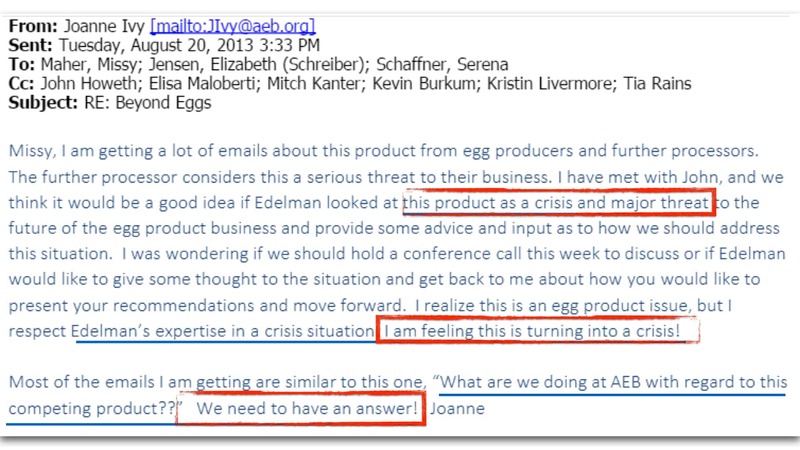 To continue their full-frontal egg-sault (that’s the last one for real) the American Egg Board hired Edelman, the world’s largest crisis management firm to lead a campaign against Hampton Creek with the USDA approving the key messages. 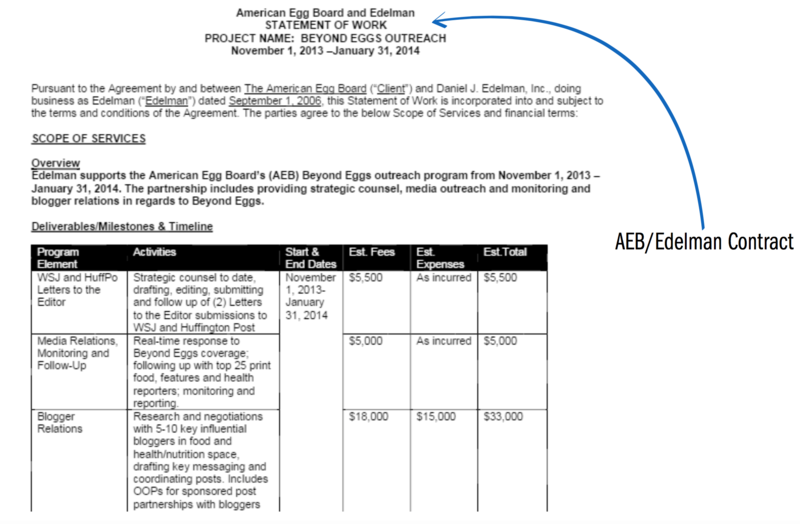 They budgeted $33,000 to pay popular food bloggers for positive pieces on the wonders of eggs. 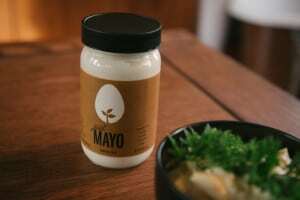 Both Mike Spencer, Executive Vice President at Hidden Villa Ranch, a Hampton Creek Competitor, and Mitch Kanter, the Executive Directore of the American Egg Board’s Egg Nutrition Center, joked about putting out a hit on Hampton Creek’s CEO. So let’s say, just for argument’s sake, that cholesterol in eggs isn’t bad for you and that consuming them won’t kill you. Well, apparently, creating plant-based alternative to them just might. Thus ends the two-year epic of Big Egg vs. Hampton Creek. Or so we hope. Interestingly enough, while the American Egg Board and USDA project a unified front in public, behind the scenes, even the USDA has to try and reign in the apparently boundless cojones of the egg industry. 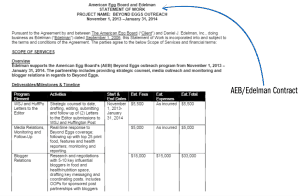 In another juicy exchange unearthed by the Freedom of Information Act and phenomenally documented by Dr. Greger in a video , we see the egg industry trying to create advertisements with American Egg Board money. You see, when an egg company wants to create an ad, they can do so with their own funds and say absolutely whatever they want, or they can dip into the expansive advertising budget of the American Egg Board, but then be subject to the USDA’s regulations. 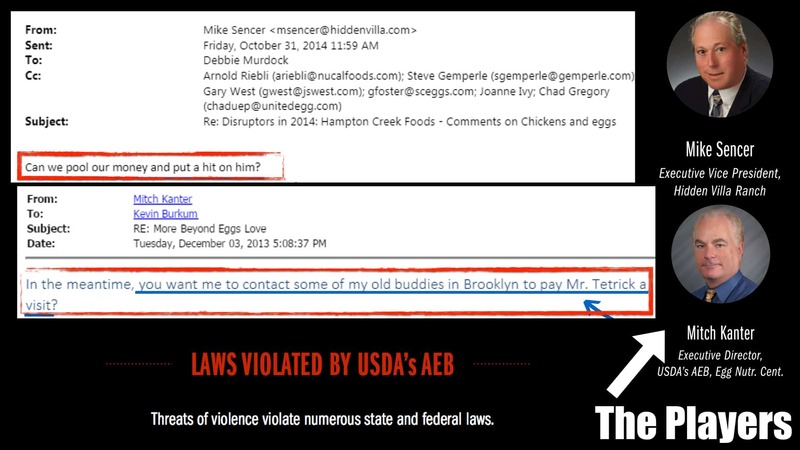 Now keep in mind that the USDA has a vested interest in marketing eggs and basically has a bromance with the American Egg Board, yet still has to put its foot down on the over-zealous egg industry’s penchant for untrue claims. It’s particularly interesting to read some of the USDA’s notes like: [you] “can’t use the word ‘healthy’ because of the amount of cholesterol (risk-increasing nutrient) in eggs,”  They are literally identifying cholesterol as a risk-increasing nutrient, yet the 2015 USDA New Dietary Recommendations Committee is proposing to remove any cholesterol limitation from official guidelines, something we’ll cover in detail in the health-focused egg video. The USDA also encourages crafty thinking. When told they can’t say eggs “aid in weight loss,” the egg industry instead tried “can reduce hunger,” with the USDA’s shining approval of their clever use of semantics. Because food that reduces hunger is a crowning achievement of agricultural engineering. 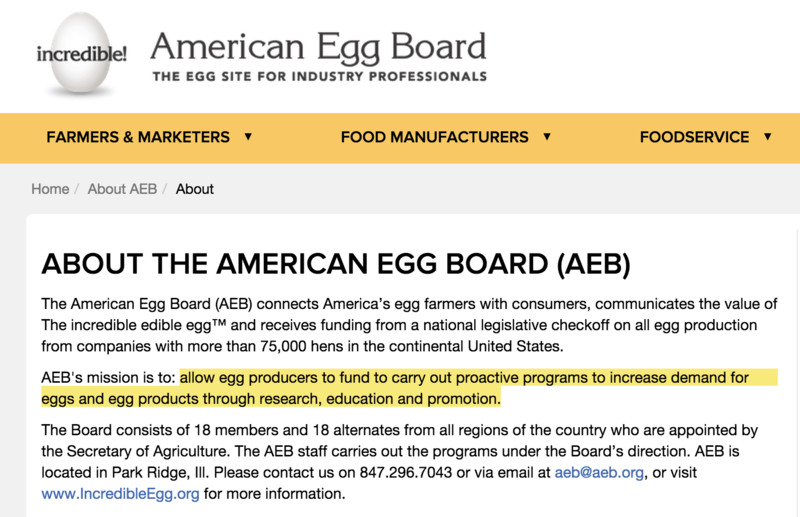 Hats off to you, American Egg Board. 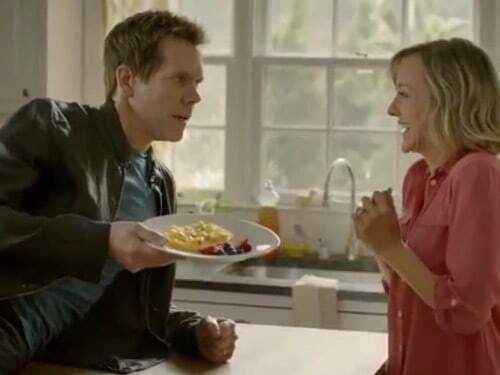 Way to step around those cholesterol-laden mines and give the American public what they want: a celebrity pimping a food the public loves, which has been shown time and again to contribute to our nation’s number one killer. Way to telling the good public how healthy they are being by continuing to consume your misunderstood gem of a product. Seeing as how you’ve paid professors, scientists, and executives to manipulate and misrepresent facts and spent billions on fierce advertising campaigns backed by thoroughly disproved science, it really makes sense to step it up to a high-name celebrity, who I’m sure performed for a nominal fee. Government-regulated dollars hard at work! Though, to your credit, this time you did use them to promote eggs, as is your mission, rather than fund illegal attacks on competitors or corrupt studies based on junk-science. Way to go, really. Now all you need is actual facts. Believe it or not, this video is but a peek into the underbelly of food industry in America. The meat, dairy and egg industries have enormous sway in our government, our dietary guidelines, school nutrition education, and so many other far-reaching facets of our society. I hope that this has been informative and illuminating. The time it to produce this video clocks in at around 83 hours. If you’d like to help support Bite Size Vegan so I can keep putting in the long hours to bring you this educational resources, please check out the support page where you can give a one-time donation or receive perks and rewards for your support by joining the Nugget Army. Please share this video post around to spread the truth. I’d love to hear your thoughts on this egg industry egg-spose. (That’s it for real.) Let me know in the comments! 4] Jack Sprat’s Legacy: The Science and Politics of Fat and Cholesterol, the Center for Science in the Public Interest, by Patricia Hausman. 5] Egg yolk consumption and carotid plaque, by J. David Spence, David J.A. 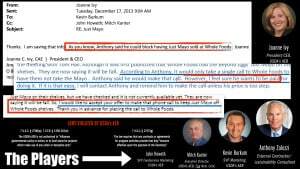 Jenkins, Jean Davignon, Atherosclerosis October 2012 Volume 224, Issue 2, Pages 469–473. 7] Food Politics: How the Food Industry Influences Nutrition and Health (2nd ed.) by Nestle, Marion, pp. 38–42. 8] Toward an End to Hunger in America by Peter K.Eisinge, pp. 78–83, 85. 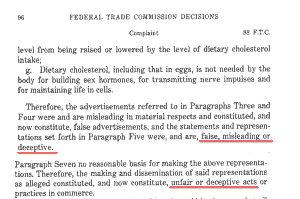 10] U.S. Senate Select Committee on Nutrition and Human Needs, “Diet Related to Killer Diseases, Volume 6, Response Regarding Eggs,” hearing July 26, 1977. 11] Task Force to the American Society of Clinical Nutrition, quoted in Hausman, Jack Sprat’s Legacy, 93– 94. 13] Michael Jacobson, preface to Hausman, Jack Sprat’s Legacy, 13– 19. 16] Dietary cholesterol and egg yolks: Not for patients at risk of vascular disease J David Spence, MD, David JA Jenkins, MD, PhD, and Jean Davignon, MD, MSc, The Canadian Journal of Cardiology 2010 Nov; 26(9): e336–e339. 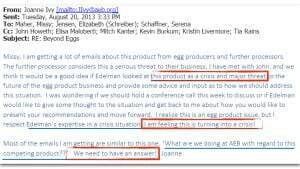 18] Example Egg Industry Paid Bloggers: Here and Here and Here (Fooducate), and Edelman's approval. 20] Validation of cooking methods using shell eggs inoculated with Salmonella serotypes Enteritidis and Heidelberg. Davis AL1, Curtis PA, Conner DE, McKee SR, Kerth LK. 22] J. Mayer, “Egg vs. Cholesterol Battle,” New York Daily News, October 9, 1974, 48. 23] The McDougall Plan by John McDougall and Mary Ann McDougall, pp. 56. 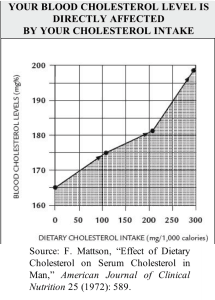 27] “Effect of Dietary Cholesterol on Serum Cholesterol in Man,”F. Mattson, American Journal of Clinical Nutrition 25 (1972): 589. 28] Robert Levy, quoted in Hausman, Jack Sprat’s Legacy, 215. 36] “Plasma lipid and lipoprotein cholesterol concentrations in adult males consuming normal and high cholesterol diets under controlled conditions.” E. Flaim, American Journal of Clinical Nutrition 34 (1981): 1103. Wow, very informative video. I am just beginning to learn that all the commercials pushing dairy and meat are only to support those industries and nothing more. We have far too long listened and believed them. I grew up with he government “food pyramid”. How anyone can believe or think that rotting, decaying animal flesh is good for you, I will ever know. Thank you so much Sally Anne! The corruption is astounding and the infiltration into every aspect of our society equally so! Hi Emily! My name is Helena. He has done research into conflicts of interest in the uk government food policy and this came up in his background reading. The USDA has joint responsibility for the promotion of health through good diet and to protect the business interests of agriculture industries. This means that, although evidence emerged that the mediterannean diet was by far the healthiest, USDA advice went in exactly the opposite direction. This study focuses on consumption of red meat. Over time, despite the knowledge of how unhealthy red meat is, USDA advice was to ´increase consumption of red meat`(that is actually a quote, with no guidance as to how much it should increase whatsoever. In the guidance that this paper analyses, the recommended intake of red meat in the US is 2500% of the intake of Greece, the country identified as having a healthy diet. I´m sorry I can´t give you more of a lowdown than this, but the whole story is there in the study – and it makes interesting reading! I hope it’s interesting for you! And thanks very much for your vegan nuggets, I enjoy all of them!! Thanks so much! 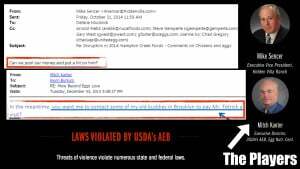 And yes, the USDA has totally conflicting interests in the truest of senses. It’s incredibly corrupt. I’ll certainly take a look! Emily, many thanks for your meticulously researched and well presented video! You are so welcome, Hadar. Thank you! Corruption? I hope everyone has read “The Dead Pit” by Michael Moss (19 January 2015) in the New York Times. The United States Meat Animal Research Center in Nebraska tortures thousands of farm animals in an attempt to increase profits for meat producers. Using taxpayer money of course! One of the more revolting things I have ever read. Keep it up Emily. Very important issue as well! That’s something I’ve been wanting to cover for some time. Hopefully soon! Really, really well done Emily. Thanks for making such a great video. You are brilliant and so appreciated. I just thought I’d add my two cents into this whole cholesterol saturated fat discussion. To me, it shows how flawed studies can be even when they seem like they’re not. Look at the studies showing how bad cholesterol, and saturated fat are for us. But, one must use common sense and realize; your body produces roughly 2,000 mg of cholesterol on it’s own. 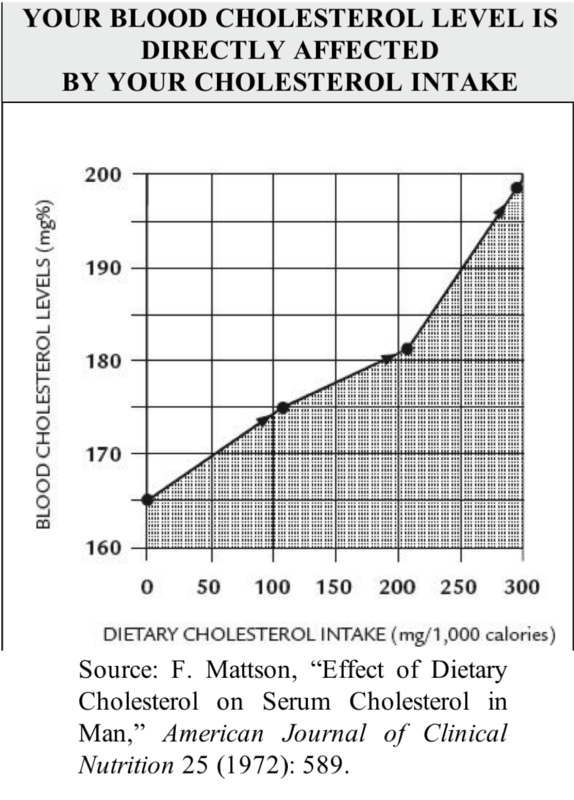 If you’re eating a plant based diet; your body is producing cholesterol. If you consume cholesterol, it slows down its production. It’s the same with saturated fat; your body produces it’s own whether you consume it or not. So how on earth would egg’s be bad for you? Because it contains something essential to your body that it will produce on it’s own either way? Now, factory farmed eggs are not the same as natural eggs. How do we know what was used in these studies? That’s like doing a study on salt, but the study uses refined salt instead of Himalayan or celtic. Of course the outcome will be different. Or, doing a study on grain fed, factory farmed beef vs grassfed natural beef. I’m sure the outcomes will once again be different. You might want to look into the case study published in the New England Journal of Medicine on a 90 year old gentlemen who ate 25 eggs per day with perfect health. I think that James has a very good point. And if we’re trying to find the Truth vs. merely get everyone to be vegan like many of us are, then turning over EVERY legitimate stone is crucial. I feel absolutely fantastic when I add hardboiled, locally-raised eggs to my predominantly plant-based diet. It takes me up a notch in energy and overall wellbeing. But I would never buy factory-farmed eggs and wouldn’t expect them to make me feel good. They’re quite literally a different animal. Thank you for this very absorbing post! I follow the Chinese Buddhist path myself and would never use any animal products, period. (to the extent that I am aware of them) Karma is inexorable and just because something might make me feel good today is of little importance. Some feel good drinking alcohol or using recreational drugs, so I don’t find this way of thinking much of a justification myself.